Beat This Caption Contest 194 Winner – Caption Contest Funny Clever Witty Enter Today! Caption Contest Funny Clever Witty Enter Today! In all fairness, he did forget the Bacon! Authorities still don’t know if the killer is still at large, extra large or jumbo! Love it! Very witty! Great Caption! :) You WIN! After a week of looking for the body, CSIs eventually found it amongst the 6 meat feast pizzas he dropped! It was later determined that some key evidence disappeared around lunch time! They placed the Pizza hut logo on the hearse, and still made pizza delivery in 30 minutes! …those only light on their feet need apply! And remember it’s not just a job it’s a freaking Adventure! A NEW Contest has already begun! Make sure you join in the Fun! 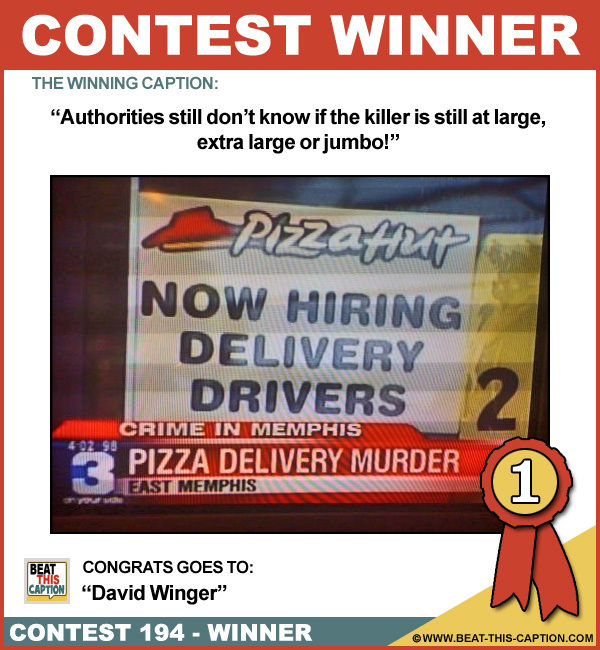 Congrats again to the Winner!